The Vancouver Condo Buzz » Affordable Surrey Condos for Sale at The SoHo Apartments by Blexo Developments – Energy Efficient Surrey SoHo Condominiums Now Selling – Win a HONDA CIVIC! Affordable Surrey Condos for Sale at The SoHo Apartments by Blexo Developments – Energy Efficient Surrey SoHo Condominiums Now Selling – Win a HONDA CIVIC! The new Surrey condos at the SoHo Scottsdale condominiums are now launching and the show suites are also open for previews. The SoHo Surrey Condos for sale are located in the vibrant urban centre of Scottsdale neighbourhood. Trendy, upscale West Coast urban architecture features entertainment sized patios and balconies, open concept floor plans as well as modern brick and shingle exterior architecture. The new Scottsdale Surrey SoHo Condominiums for sale will also present chef inspired streamlined kitchens with granite counters, fun and funky stainless steel faucets in addition to a full appliance package included standard in every new home purchase. In addition, the new Surrey SoHo Condominiums for sale will present on site amenities that include a fitness centre and guest suite. Affordably priced from just $184,000, the new SoHo Surrey condos for sale feature a new presentation centre that is now open 1-5pm daily except closed on Fridays and is located at 8168 – 120A Street, Surrey. For more information regarding the presale SoHo Surrey condos in the Scottsdale neighbourhood, please call the sales office at 778.867.SOHO (7646) or visit soholiving.ca. Only 53 new urban Surrey condos are now available at The SoHo by Blexo Developments! Now Open from 1-5pm except closed on Fridays. Buy a new SoHo Surrey Condo and win a car! There is a great 1 in 10 chance of winning a HONDA CIVIC … can you believe the odds? The one and two bedroom new Surrey SoHo condominiums will feature urban design and an ultra high-end look. Beautiful Surrey Condominiums at The SoHo Now Selling! Affordable Surrey condos with beautiful West Coast craftsman architecture that is modern and sleek are featured at the new Blexo Development at The SoHo apartments for sale. Award winning Barnett Dembeck Architects designed the affordable Surrey SoHo condos for sale. Blexo Developments have crafted your new Surrey condo with entertainment sized patios and outdoor living spaces in addition to a modern brick and shingle exterior that is both low maintenance and striking. All homes at the new SoHo Surrey affordable condos for sale come with the new home warranty for your peace of mind in addition to multiple other interior features that are just outstanding. 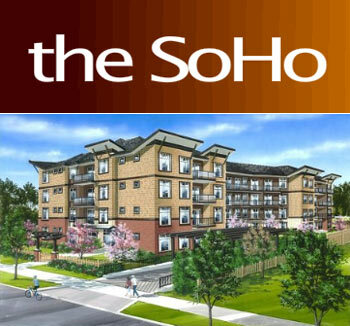 The location of the SoHo Surrey condos for sale is at 8168 120A Street, Surrey, BC and the price point for these affordable Surrey condominiums start from just $184,000. Some of the energy efficient features at The SoHo apartments include patio doors with Low E glass, double glazed Low E Energy Star windows, insulated double wall construction, insulated electric fireplaces and individual domestic hot water system. For your peace of mind and security, all homes at the affordable Surrey SoHo condos for sale will cindlude approved fire suppressant sprinkler system, smoke alarm detection, door viewer, rough in for alarm system, deadbolt and entry locks, gate and security cameras, secure storage lockers and bike storage in addition to a well lit underground parking garage with dedicated stalls per suite. The home warranty included at the Soho Surrey condos for sale is two-five-ten year. The premium kitchens have under counter task lights, double stainless steel sinks garburator, built in microwave and hood fan combination, self cleaning slide in range, and multi cycle dishwasher. In addition, The SoHo Surrey condominiums have stainless steel appliance sets with Energy Efficient standards, hanging ceiling light, tiled backplash, granite counters and contemporary shaker style Maple cabinets with brushed nickel hardware for that contemporary look. The refreshing bathrooms at the new Surrey affordable condos at the SoHo apartments feature modern chrome polished hardware, sophisticated mirrors, Euro style cabinets, deep soaker tubs, premium bath fixtures and fittings, ceramic tiled surrounds and stylish granite counters. Homebuyer at The SoHo Surrey affordable condos have a choice between two professionally designed palettes in addition to laminate flooring, 100% nylon carpets, electric fireplaces with mantles, overheight ceilings, crown mouldings and pre wiring for security alarm systems. West Coast urban style architecture with deep roof overhangs and low maintenance exteriors are featured here at The SoHo by Blexo Developments. In addition, the affordable Surrey condos for sale feature convenient weatherproof exterior electric outlets, hose bibs on ground floor, entertainment sized outdoor living spaces, metal and glass balcony rail with tempered glass and shingle roofing with a thirty year warranty. There is a modern burgundy brick and inca mission texture to the exterior siding as well. The SoHo Surrey affordable condos feature a furnished entrance lobby that is inviting in addition to bike storage, exercise gym and recreation room with a small catering kitchen too. The new SoHo Surrey condos feature a great location close to amazing shops, trendy restaurants, grocery stores, banks, schools and great recreational options. With June and July move-in dates, you can enjoy your new home very soon! The two sales managers for the SoHo Surrey condo development includes Sheri and Jenny, so make sure you contact 778.867.SOHO for additional details about the availability. The first ten FIRM sales at The SoHo Surrey get entered into a draw to win a HONDA CIVIC from BLEXO Developments. The winner of the draw will receive the car of their colour choice upon completion. For more details, ask the sales professionals of The Surrey SoHo Condos. There are 19 unique floor plans to choose from which are all available online at soholiving.ca. In addition, the most current price list is also online. The price range for these affordable Surrey condos at The SoHo by Blexo Developments ranges from $187k to $275k for the larger 914 square foot penthouse units (2 bedrooms).